Combine a classic cruise on the Blue Danube with three nights in Prague, the capital of the Czech Republic. Explore a series of beautiful cities on included tours, and relax into life on board a comfortable, contemporary A-ROSA river cruiser. Flights also available from airports in England – Birmingham, Bristol, Manchester, London Heathrow, Luton, Southend and Stansted – click here for more information on dates & prices. 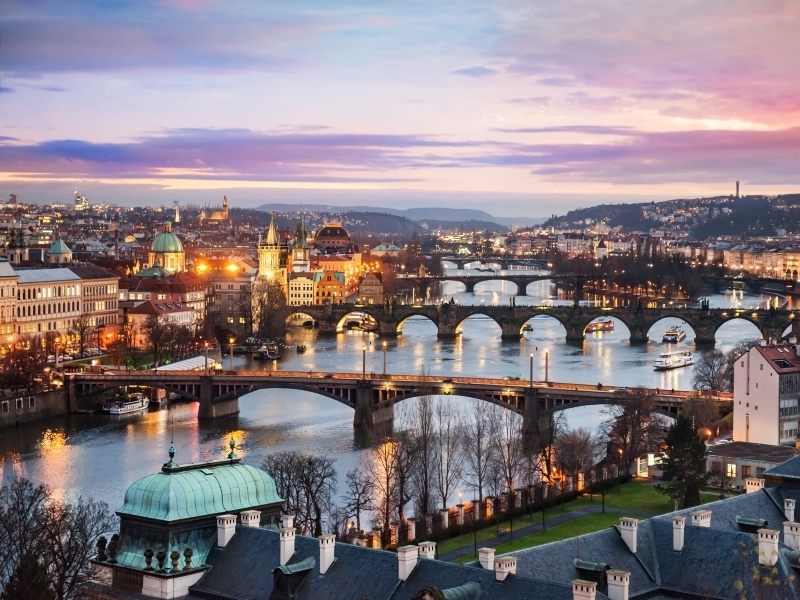 Fly to Prague to begin your holiday with three fascinating days in the city. Enjoy an included guided tour of the Old Town with its vast cobbled square, overlooked by the famous astronomical clock. You’ll then have the rest of the time to spend at your leisure. Why not visit the Castle District across the River Vlatava, spanned by the famous Charles Bridge? Or sit back and watch the world go by from the city’s famously lively cafes and bars. Today you’ll leave Prague and head south to Engelhartszell in Austria to board the A-ROSA DONNA. Once on board you’ll be free to settle in and get to know the ship, which will set sail in the early evening to begin your Danube cruise. Around lunchtime today you’ll arrive in Vienna, the glorious Austrian capital, city of ‘coffee and cake’, of Strauss waltzes, musical geniuses, philosophers and thinkers. The city is home to astonishing palaces, elegant arcades and imposing historic buildings, and you’ll have time to enjoy strolling its magnificent squares and open spaces after a guided tour sets the scene. Spend another day exploring Vienna’s 100-plus museums and art galleries, or relax and spend the day with friends watching the lively bustle from the comfort of a typical Viennese coffee shop. Visit the famous Schonbrunn palace, a stage from which a young Mozart captivated an astonished audience, or stroll the wondrous streets, lined with fascinating ancient and modern architecture, until A-ROSA DONNA sails onward in the early evening. Early this morning, you’ll arrive in Esztergom. One of the oldest towns in Hungary, Esztergom is also home to the country’s largest church and tallest building – the dome-capped Basilica. Spend a few hours here, then return to A-ROSA DONNA and continue down the Danube to Budapest. The Hungarian capital and the ‘Pearl of the Danube’ is an endlessly enthralling and engaging city. On its left bank, Buda, lies the romantic, colourful Castle Hill. On the Pest side, which is dominated by the great Gothic Parliament building, you’ll find an elegant maze of designer shops, coffee houses, patisseries and restaurants. Visit awe-inspiring St Stephen’s Basilica or perhaps relax in one of the city’s many thermal baths. Today you’ll be free to carry on exploring Budapest. In this city of art, culture and history, you’ll never be short of things to enjoy. Why not visit Fisherman’s Bastion, which commemorates the original Magyar settlers of Hungary, or see the statues, pillars and colonnades on Heroes’ Square? After another scenic morning cruise, you’ll arrive in Bratislava, Slovakia. Bordering Hungary and Austria, the compact, medieval Slovakian capital is an absolute treasure. Centred on St Martin’s Cathedral, it boasts splendid Baroque palaces, an ancient suspension bridge and a celebrated, lively cafe culture. The ship departs again in the early evening. After a picturesque and memorable cruise though Austria’s Wachau Valley, this morning, you will arrive in Melk. This authentic Austrian market town is home to one of the Danube’s most visited attractions – the vast UNESCO-listed Abbey that towers over the pretty streets. Admire the medieval-Baroque architecture, share memories of your holiday over a coffee and be ready for the ship to leave in the late afternoon. Say farewell to A-ROSA DONNA and all your new friends today, as you disembark at Englhartszell to meet your included transfer to the airport and catch your flight home.